Review Notes: A copy of the game was provided for review purposes. Due to time constraints, we will be focusing mainly on the latest chapter of the Divinity saga, the Divinity II: Developer’s Cut. The Divinity Anthology is the definitive collection for Larian Studios’ critically-acclaimed fantasy RPG series, bundling three official games together at an affordable price: Divine Divinity, Beyond Divinity, and the Divinity II: Developer’s Cut that features Ego Draconis and Flames of Vengeance. All included in the massive anthology. This collection features hundreds of hours of entertainment, allowing gamers to experience the full saga in its entirety and explore Larian’s magic-infused fantasy universe. The Divinity games whisk players away to a legendary world where mighty dragons wreak havoc across the land and where the fog of myth and legend is thickly entwined with magic and mystery. The Divinity Anthology chronicles the evolution of the series throughout the years, showcasing the growth in terms of visual presentation and infusion of gameplay mechanics. Players get to experience the start of the series with Divine Divinity, seeing how the first chapter set the story and tone for the spin-off Beyond Divinity, which introduces bold new features and a robust continuation of the story arc. Players then get to experience the best that Larian has to offer with the dynamic and impressive Divinity II which provides spellbinding gameplay that enchants gamers with its open-world fantasy action. A Dragon Slayer airship hunts a fearsome dragon in the skies of Rivellon. “Dragons: they have been hunted, they have been slain, but now the hour to strike back has come. Break free from the confines of the human body and take to the skies in this epic RPG adventure that challenges your wits and pits you against a thousand foes. Divinity II is a direct sequel to the events that took place in Divine Divinity. Players start out as a Dragon Slayer initiate who is on their way to completing their initiation ritual at Fellglow and becoming a true Slayer. Dragon Slayers are the last bastion of protection against the terrifying winged dragons, and they are honorbound to hunt and kill every dragon throughout the world or Rivellon. Dragons are a very real threat and wreak total havoc and destruction wherever they go, making them one of the most lethal and deadly creatures in the entire world. Being a Dragon Slayer is a highly esteemed and noble occupation, and every citizen, guard, and mercenary respects the Slayers for their invaluable service. Dragon Slayers are an ancient organization of the strongest and most disciplined warriors across the land–only the best of the best are chosen to become Dragon Slayers. At Fellglow, players are enchanted with the special abilities reserved for Dragon Slayers, who must take on many of the same abilities as the dragons themselves. To be able to hunt a dragon, you must first understand it–and share its memories as well as its power. Both Dragon Knights and Dragon Slayers possess the signature silvery eyes, warning foes and townspeople of their fearsome status. After being infused with the legendary magics, our hero’s eyes forever shine with the silvery hue that defines a Dragon Slayer, and now has the signature abilities–such as mind reading–that are associated with the role. Commander Rhodes, the leader of the current band of Slayers, has received word that a dragon has been spotted nearby in Broken Valley. It is with this tip of a nearby dragon to hunt that our hero’s epic journey begins, and players are whisked away in a mightily impressive airship fortress to the Broken Valley to investigate. Damian, the evil one, looks down upon the world from above. Telana, the last of the Dragon Knights–the Betrayers who possess the rare ability to transform into a dragon–is discovered, and, after a bloody battle with Rhodes and the other Slayers, comes across our hero. Telana bestows upon our hero the gift and curse of the Dragon Knights, inducting our hero into the nefarious order with the ability to transform into a dragon at will. Rivellon is a sprawling fantasy world with dozens of towns and villages with their own signature style and design. Divinity II has familiar mechanics that are pretty much akin to nearly every PC RPG on the market today. It has your standard interface that displays Health and Mana, an EXP bar, a mini-map (which is incredibly useful), and a series of internal menus that display Inventory, Hero Status, Skills, Quests, and so on. Players can interact with both their environments and the people within the towns, and hone their skills by battling hordes of enemies that litter the outer areas. The controls for this game are pretty self-explanatory and are easy to use: keeping the standard ASDW movement scheme. Players control the third-person view perspective via a mouse-controlled camera, and an on-screen crosshair allows for both aim with projectile weapons, melee attacks, and magical attacks as well as environment/character interaction. Divinity II is a free-roam fantasy game wherein gamers can fully explore the exteriors and interiors in any given area. Most areas are separated by a safe zone in the form of a town, and a danger zone that’s pretty much everywhere else and is usually crawling with creatures and baddies. The enemies themselves have an aggro radius that’s akin to WoW, and they won’t come at you unless you’re nearby. The main statistics for each hero and their in-game effects. 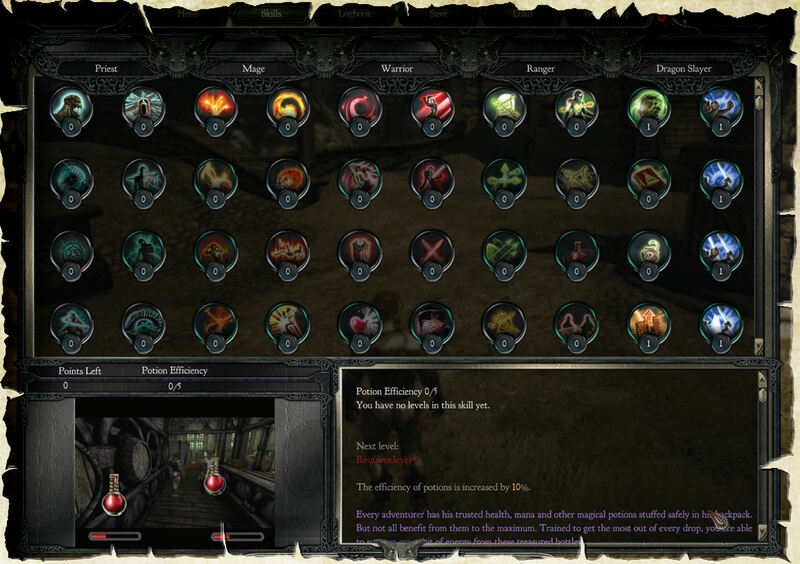 Players have a mini-bar on the bottom of the screen that can be customized for skills–such as powerful ranged attacks or fireball spells–as well as inventory items such as potions or food, making for a convenient hotkey bar that can often be the difference between life and death. Upon level up, players receive a single Skill Point as well as four Stat Points to add into their Hero’s statistics. The statistics range from resiliency in battle to magical defense, and everything in between. There are five different stats: Vitality, Spirit, Strength, Dexterity, and Intelligence, and each of them affect players in various ways including melee/ranged resistances and the Conditioned Body (overall combat resilience), Heightened Reflexes (critical hit damage) and Indomitable Will (mana and spell resistances) stats. Action-packed combat makes up the bulk of Divinity II‘s gameplay, and is quite enjoyable and satisfying. The way that players behave in combat entirely depends on their proficiency in the three main combat types: Ranged, Melee, and Magic. Customization in one or all of the trees can be a rewarding experience and provide quite unique versatility, combining the skills in many different ways to become a veritable jack-of-all-trades. Casting spells like helpful buffs can turn the tide of battle in your favor, especially when facing fearsome opponents. Gamers who wield a massive two-handed sword prefer to be up close and personal with their attacks, dishing out devastating blows and tanking hits now and again. Players who prefer the agile and lithe ranged combat type will find themselves attacking at a distance, and using the space bar to jump and roll side-to-side to avoid attacks, since they have lower defense and a limited pool of health. The dodging and rolling tactics also work quite well for mages, who can annihilate enemies with powerful elemental attacks but can sometimes end up being glass cannons who shatter under a few hits. One of the best things about the game is that you can combine skills in every combat tree. You don’t have to stick to one type, and have free reign to mix and match your skills as you see fit. Players who make use of ranged attacks will get used to locking-on to enemies via the ‘R’ key, making it so they don’t have to mouse-over and aim each time. This function is extremely useful for any bow or magical attacks and is essential to combat. Locking on is just as important in this game as it is The Legend of Zelda: Ocarina of Time. Success in combat entirely depends on your play style and your combat strategies, and how well you maintain the use of tactical advantage. Launching deadly fireballs and elemental attacks or a volley of arrows while on higher ground is a great way to use the environment to your advantage, especially if you want to pick off a powerful leader of a power of enemies. Becoming a dragon is one of the most enjoyable elements in the game and truly brings a sense of fantasy and magic to gameplay. Playing as a dragon is Divinity II‘s signature and hallmark feature, and it’s definitely one of the most satisfying elements of the game. Soaring the skies and launching ferocious fireballs and reducing enemies to hot ash is invigorating and truly imbibes a sense of power within players. As a dragon, gamers fly high in the skies of Rivellon, and the basic interface remains the same–the same familiar control scheme, the hotkeys with various spells and abilities are still there, and you control the crosshair with the mouse. Overall the controls and combat while in dragon form are exceedingly fluid and graceful, and really make players feel as if they are tearing through the air as a deadly and menacing winged wyrm. The dragons possess various abilities that are unlocked via a special skill tree, and range from passive buffs to powerful magical attacks. While playing as a dragon, it’s easy to see why they’re so feared and hunted by the Dragon Slayers: they really are exceedingly efficient predators who are at the top of their food chain. Skills are diverse and range from helpful passive abilities to active spells and attacks. The skill trees themselves consist of five trees: Priest, Mage, Warrior, Ranger, and Dragon Slayer. Rather than being dynamic, the skills in Divinity II aren’t like that found in most RPGs: certain skills don’t require previous skills to be unlocked, only require a certain level. This allows players to freely mix and match whatever skills they like, which is extremely useful and shows Larian’s unique approach to RPG mechanics. Every skill has its use and each of them can be helpful in various situations. Skills like Lockpicking can earn you some quick money and access to locked chests with treasures and items, whereas other passive abilities like Potion Effectiveness provide invaluable bonuses to potion strength. It can sometimes be hard to decide what skills you’d like, but a utilitarian approach to filling out skills can prove to be very useful. Quests are a major factor in any RPG, and Divinity II is no different. Featuring side-quests and main quests, players can whittle away the hours and earn gold and weapons by partaking in various missions that can be unlocked from simply interacting with NPC’s and townspeople. Quests range from simple retrieval and fetch missions to important bandit slayings, and pretty much everything in between. Upon completion of a quest, players get to pick a reward. This is quite interesting, as many other RPG’s don’t allow gamers to pick between so many rewards. Sometimes you’ll even get to pick multiple rewards, and they usually range from XP, Gold, magical/unique/set weapons or items, potions, and even charms. Conversations with NPC’s feature full voice acting and are quite dynamic, often involving the discovery of questlines. Players will have to make certain decisions whether or not to help a certain NPC with a quest or problem. Sometimes the decisions are trivial and don’t affect anything but a merchant’s disposition of you, but other times they can affect other people’s lives and put others in direct danger. Decisions can never be taken back, so it’s important to try to weigh your morals and do what you think it right–or most profitable. Divinity II features a huge array of weapons and items to equip, and is much akin to dungeon-crawling titles such as Diablo or Torchlight. While the game itself is larger in scope and has a more free-roam, open-world feel to it, the weapons and items retain the same randomized elements that are found in these games, many of which having potent magical properties that can be enchanted with charms and made even better. There are many different grades of armor and weapons from magical to set to unique; each with their own randomized enchantments and elements. Charms can be socketed into items with free slots to amplify certain elements, adding to the overall effectiveness of the items. Potions are essential, and come in many forms such as health, mana, and stat-altering varieties. Potions can augment Strength and how many items players can hold, as well as provide helpful bonuses to aid players while in battle. Food is also extremely helpful and replenishes health, and is readily available in towns for low prices–and can be found sitting around in taverns and on tables. 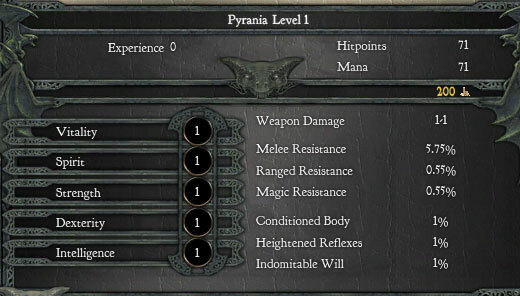 Literally hundreds of pieces of weapons, armor, and trinkets can be found and bought within Divinity II, each with their own unique enchantments. Keeping up with the most resilient armor and strong weaponry is an important aspect of the game, and it’s often necessary to upgrade and purchase new items before moving on to the next area. Having good armor can only benefit the player, and more powerful weaponry allows for efficient combat and easy kills. It can be costly, but it’s worth it–but many of the best weapons, armor, and jewelry can be found on the field. Players can equip up to three different combinations of weapons at a time, similar to Diablo II‘s secondary equipment slot. This is very useful especially when certain combat scenarios are best solved at long range with a bow, or up close with a sword and shield. These three slots can be switched on-the-fly, providing for fast and easy switches when various opportunities present themselves. Divinity II: Developer’s Cut features a plethora of unique features including in-game access to console commands that allow players to literally do whatever you’d like within the game, such as unlock weapons and armor with untold powers, or max out skills and find out which is your favorite. This allows gamers to have a field day of fun, providing hours of amusement as they fry fields of goblins with insanely powerful magic spells. Another unique feature of this game is the level of personality that the NPC’s exhibit. Every time you talk to a townsperson or in-game character, the conversation seems quite realistic and the NPC’s are animated and have their own voice registers: they don’t stand there like robots and speak in monotone. They tell jokes, laugh, and move around with gestures and realistic movements, and honestly act just like real people would. This is refreshing, and hilarious in many ways, considering many of the characters are quite quirky and funny. The conversations with NPC’s throughout Divinity II are dynamic and offer many unique responses. One of the most unique features of Divinity II is its use of a dynamic story that unfolds based on the choices and decisions you make, akin to BioWare’s Mass Effect and Dragon Age series. Many of the conversations that players take part in have multiple choices that can alter how the NPC’s see you, or can help players solve certain quests. The Mindread ability is extremely helpful with conversations and can often learn secrets to plot lines and quests. Many of the conversations can be trivial and small things, but the main ones determine and shape the future of the world of Rivellon. This dynamism is impressive and adds in new weight to every decision made throughout the game, especially since they can change and alter not only the people, but the entire land of Rivellon itself. The Divinity Anthology is the quintessential Divinity experience, allowing gamers to experience Larian’s complete RPG saga in its entirety from beginning to end. It’s easy to lose yourself in the amazingly detailed fantasy world of Rivellon, pouring hundreds of hours within its magic-infused world while tackling Damian and his evil hordes and flying the skies as a dragon. The Divinity games truly offer an astounding and unique role-playing experience that makes use of many original mechanics and seamlessly blends the familiar with brand new elements, delivering a masterful story arc that spans an entire franchise. From start to finish, each game provides a dazzling and engaging spectacle of ingenuity and provides for an entertaining experience for any gamer, especially fans of high fantasy. With a dynamic system where every choice matters and a sprawling open world to explore, coupled with a huge array of loot and a mix-and-match skill system, the Divinity games call to the Dragon Slayer in all of us with its sweet psiren song. The Anthology is literally a treasure trove of splendid RPG goodness, and will bring a smile to anyone who chooses to delve into the land of Rivellon and learn the secrets of the dragons. + Turning into a dragon is AWESOME!